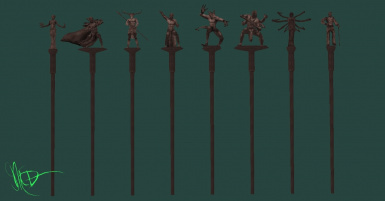 This mod adds some new staffs, one for several of the major Daedra Princes. They can be found in shrines to each of those princes. You'll have to search hard to find each of them, but should be worth the effort. They are not enchanted but have high enchant ratings and are good quality. This mod has been cleaned with Enchanted Editor. So no worries. As I said before, the staffs are hidden. But I'll give you a hint on one: Where's the most obvious place where the Staff of Azura would be? Aside from that, I have spoilers below. Oh, and Hircine and Mephala have had new shrines constructed for them. So, don't look for their staffs in existing ruins... be careful their shrines are guarded by dangerous creatures. Fine, I'll give you hints on their locations too. Hircine's shrine lies to the north, between A dwemer ruin and the misty sea. Mephala's Shrine is hidden among farmland, alongside a pool of water. 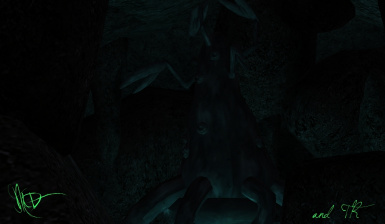 Hermaeus Mora's Shrine is in a watery cavern in the torn region to the west, south of a lost dunmer outpost. Anything which alters the exact exterior locations of the Shrine of Mephala or Hircine's Shrine. Or severely alters the interiors of the shrines where I placed the staffs. Please do not upload this anywhere without my permission. But feel free to use any of the meshes or textures which I have created herein in your own mod. Just please give me credit where credit is due. 1.50 Staff of Hermaeus Mora added, along with a small shrine dedicated to the same Lord.